Rent Bridal Car: Congratulation to Adrian and Jasmine! Congratulation to Adrian and Jasmine! 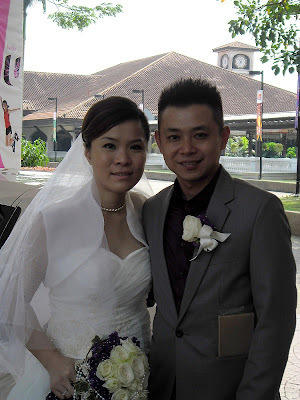 Newly Wedded on 23 July 2011! Thanks so much for your wonderful service & professionalism, not forgetting to mention your handsome white Jaguar running outstandingly on the road which drew several attention. 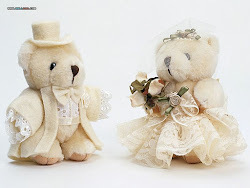 You have certainly ease much of our worries in the midst of our crazy wedding preparation with your prompt response, being accomodative with our many requests, your generous assistance to coordinate bridal car deco with our florist, your punctuality on actual day and sharing your advice & experiences for newly wed couple. It is definitely a two thumbs up for your service. Though it's not possible for us to engage your service again ;).. we would strongly publicise to all our friends should the opportunity comes by. 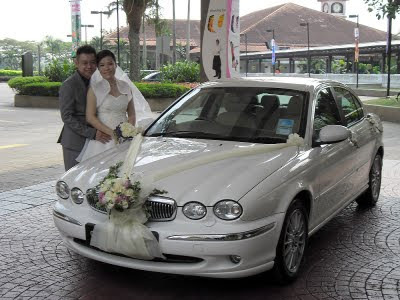 Once again, truly appreciate your marvellous assistance & yes, we are glad that we didn't accept other bridal cars offer. Cheers! Congratulation to Christopher and Carol!